May 23, 2018 (Burlington, ON) – In front of an extremely engaged audience of local councilors, hundreds of business owners, families, and friends, the entrepreneurial spirit was alive and well at the 5th annual Pythons’ Pit Finale last night at the beautiful Burlington Performing Arts Centre. Pythons’ Pit provides an avenue for creative and entrepreneurial high school students of Halton Region to pitch their business concepts and product ideas in front of a live audience and a panel of four business moguls from the community. The entire competition will debut as a YouTube series later this year. It was a wonderful evening beginning with a special VIP Reception on behalf of the events’ presenting sponsors, RBC & MNP, which included greetings from VIP guests and representatives from the sponsors. A gift presentation from RBC & MNP to all contest finalists took place in addition to a celebration of another successful year of encouraging entrepreneurship among students of Halton region. Following the reception was the live finale where the theatre was filled with guests as the top three finalists performed their pitches on stage to the 2018 Pythons. It was a thrilling conclusion to yet another extremely successful season of mentoring applicants and finalists of this innovative competition, which was first established by members of Halton based Rotary Clubs five years ago. Riya Karumanchi, a grade nine student from White Oakes Secondary School (Oakville), won first place and was awarded $3,500 for her pitch on SmartCane. SmartCane is a reimagined assistive tech device for the visually impaired that enables ease of mobility and autonomy. Designed with the user in mind, the SmartCane is a white cane with added features to maximize user independence and safety. There is adjustable object detection, GPS functionalities, an emergency button, and location sharing. Gurjog Gambhir of Abbey Park High School (Oakville) won second price and was awarded $2,500 for his standalone machine, Buy Mine, used to buy and trade cell phones. With third place and $1,500 going to Sarah Jalal, also from White Oaks Secondary School (Oakville), for her home décor and accessory subscription box service, Corbello. This year’s Pythons included Sarab Hans, President of Hans Dairy Inc., whose family business processes milk products focused toward the South Asian community. Kelly Shorer, Vice President and Portfolio Manager of Shorer Wealth Management of RBC Dominion Securities, also provided his expertise. Another Python was James Loewen, President of Loewen Group Mortgages, which is recognized year-over-year at the Canadian Mortgage Awards. The final Python was Clinton Howell, a custom home theatre and smart home designer and realtor with Re/Max Escarpment Realty Inc.
Not only do the Pythons reflect on and evaluate the students’ pitches but they also provide valuable life advice for the future. “I believe that a good mentor, continuous education, goal setting, and a clear vision of the future are keys to a successful career in any industry,” says Kelly Shorer. Have the next big idea? It’s never too early to start planning for next year. Applications for 2019 Pythons’ Pit Competition will be opening in December 2018. All contest information can be found at www.pythonspit.ca, and you can stay up-to-date by following Pythons’ Pit on Facebook and Twitter. In its 5th season, Pythons’ Pit is Halton Region’s most successful competition promoting entrepreneurship. 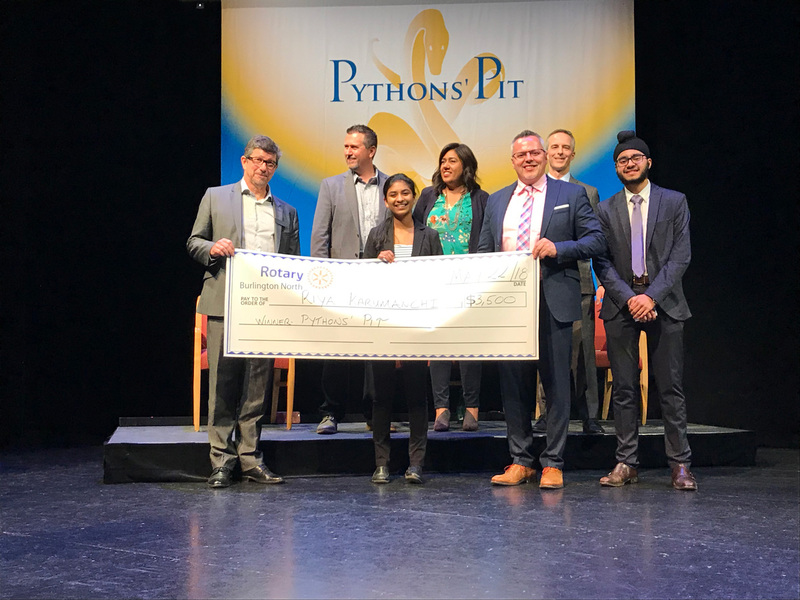 An initiative from Rotary Clubs of Halton, Pythons’ Pit is made possible by a number of sponsors, including presenting sponsors RBC & MNP, passionate mentors and volunteers and the whole community.